While most foods are either savory or sweet, and assumed to be either a breakfast, dinner, or dessert item, Crepes are the incredibly dynamic exception. You can find crepes for breakfast, dinner, and dessert. The biggest differentiation is the fillings served with scrumptious batter. A crepe is simply made by pouring a very thin liquid batter onto a lightly buttered flat scorching surface. It is essential for the batter to be spread evenly and very thinly to ensure proper consistency. If the batter is too thick or the pan is too hot, the crepe could tear or become lumpy. Crepes are famous for their consistency, and for being served with fillings, so exquisite lumps need to be left with the ladies. A crepe’s versatility is due largely in part to the variety of fillings that can be used. Remember that scene from Forrest Gump where they talk about the 927 different variations of shrimp, it’s kind of like that. 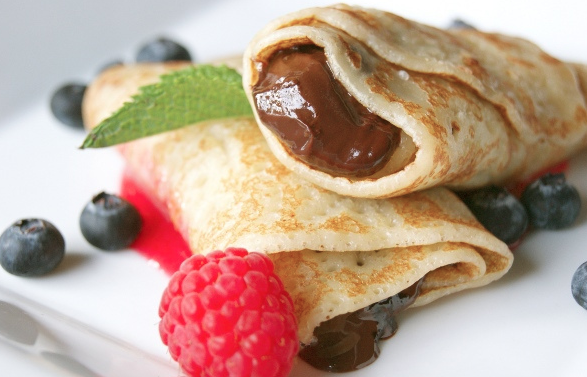 Crepes can be served with sweet filings for breakfast or dessert, and savory for lunch and dinner. Sweet fillings can be sliced fruits or fruit spreads, custard, chocolate, or hazelnut and topped with powdered sugar, syrup, or whipped cream. Savory fillings can be anything from meats such as ham, cheese, egg, and mushrooms. Normally, the fillings are added to the center and served with the edges folded partially over the center. While crepes come in all kinds of varieties, and can be served in countless different ways, one of the most famous crepe dishes is the Crepe Suzette. The Crepe Suzette is a dessert of French origin that is a freshly cooked crepe with sugar and Grand Marnier liqueur. The liqueur is ignited, making the alcohol evaporate L and leaving behind a thick, delicious caramelized sauce J. In restaurants, it‘s often prepared in front of the guests for a bit of excitement before indulging in the dessert. The next time you are at a food truck rally in Tampa Bay and happen past the Krepelicious Crepe truck, remember it doesn’t matter whether you are in the mood for breakfast, dinner, or dessert…you can always be in the mood for a crepe!